*Bhai Dooj is celebrated two days after Diwali. *Like Raksha Bandhan, it is a day dedicated to the sacred love between a brother and sister. *Both Raksha Bandhan and Bhai Dooj fall in Chaturmas; one at the start and the other at the end of the four months of negative state of mind. The Jagannath Yatra (another festival of love between brother and sister where Krishna is worshipped with his sister Subhadra) is also held in Chaturmas. All three festivals signify purification of mind, getting it lust free and reminding the people a sacred relationship between men and women. *The festival is known as “Bhau-Beej” in Marathi and “Bhai-Tika” in Nepal. 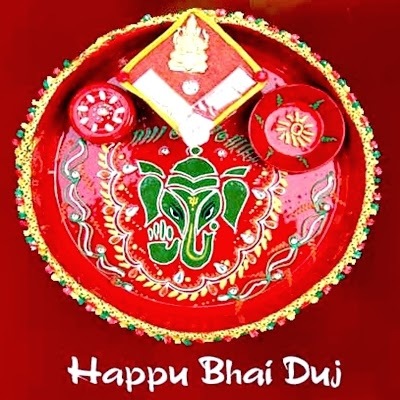 *On Bhai Dooj sisters pray for the wellbeing and prosperity of their brothers by putting tika/tilak (vermilion spot) on their forehead and offer sweets (healthy) and perform a ritual of taking their ’Aarti’. The brother offers gifts as an expression of love. Some sisters may fast on this day; gifts often involve rice, new grass, aab’ (a length of flax, knotted into a circular shape and dotted with sugar batashas) etc. In Bihar, the ritual starts with the sister cursing her brother, before asking for his forgiveness. *Rice in mythology symbolizes the fulfilled desires and the ritual on this day signifies a non lust based sacred relationship between a man and a woman. Whole DWARKA will march for UNITY on 7th Nov.